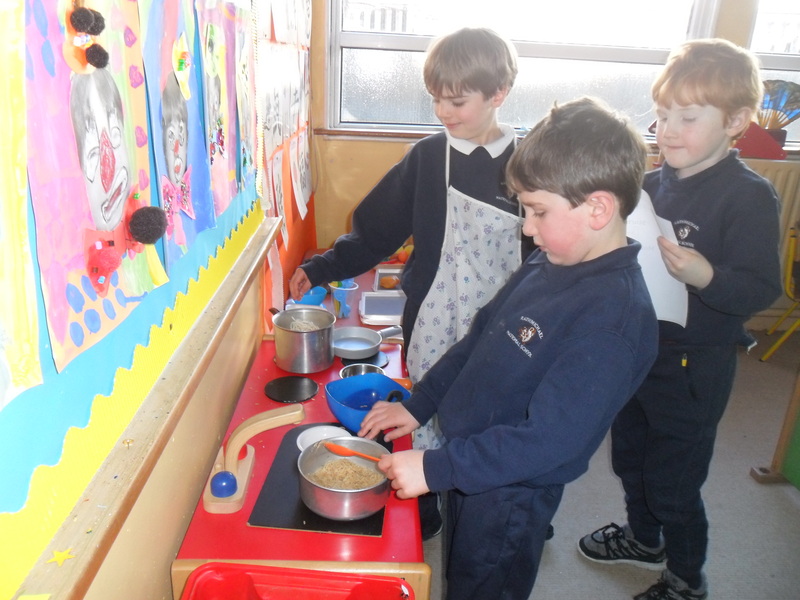 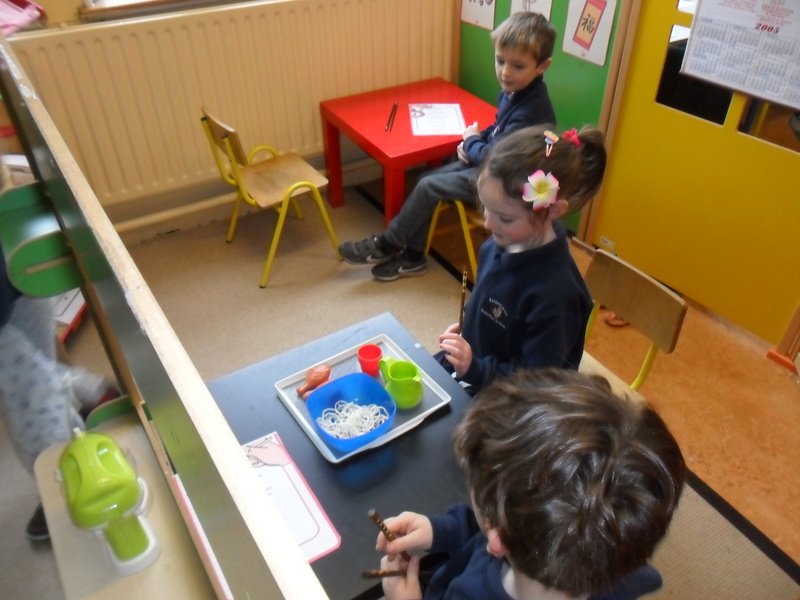 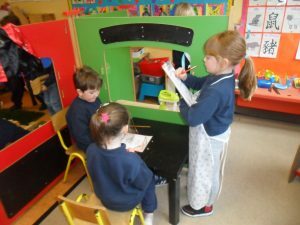 February and March’s Aistear theme is ‘Showtime’. 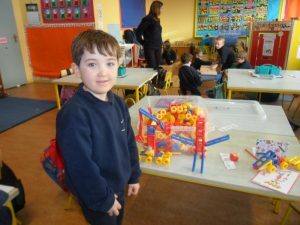 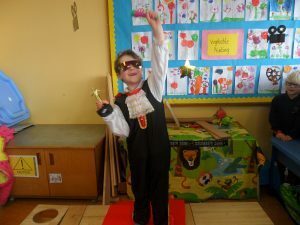 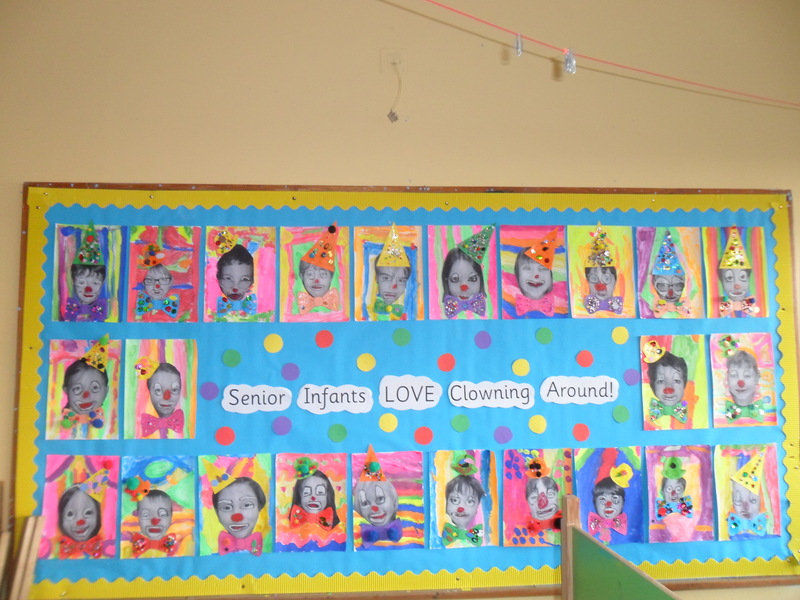 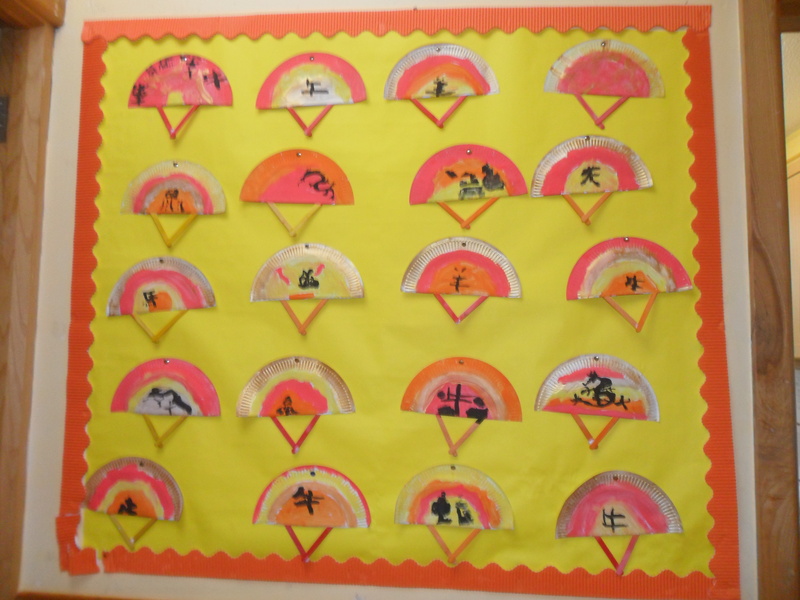 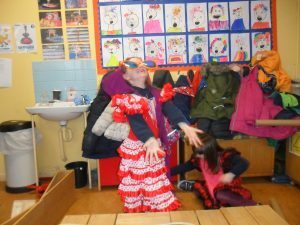 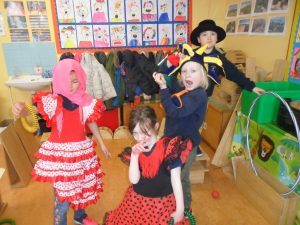 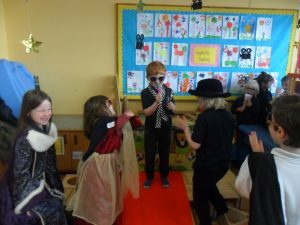 The children have been learning about the circus, Chinese New Year, the movie world, carnivals and fairgrounds. 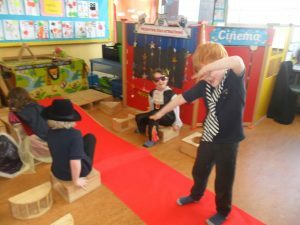 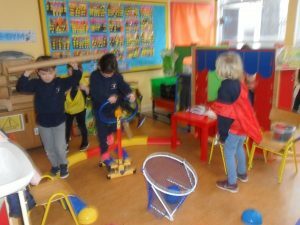 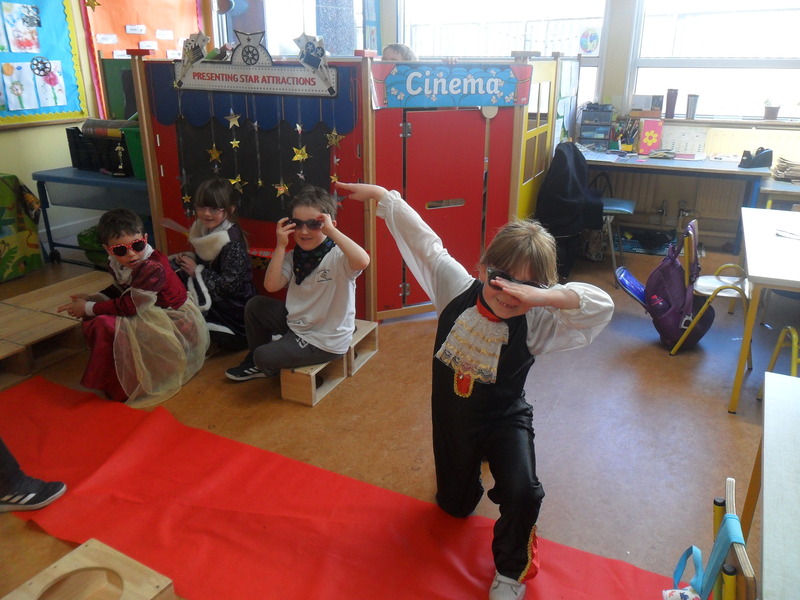 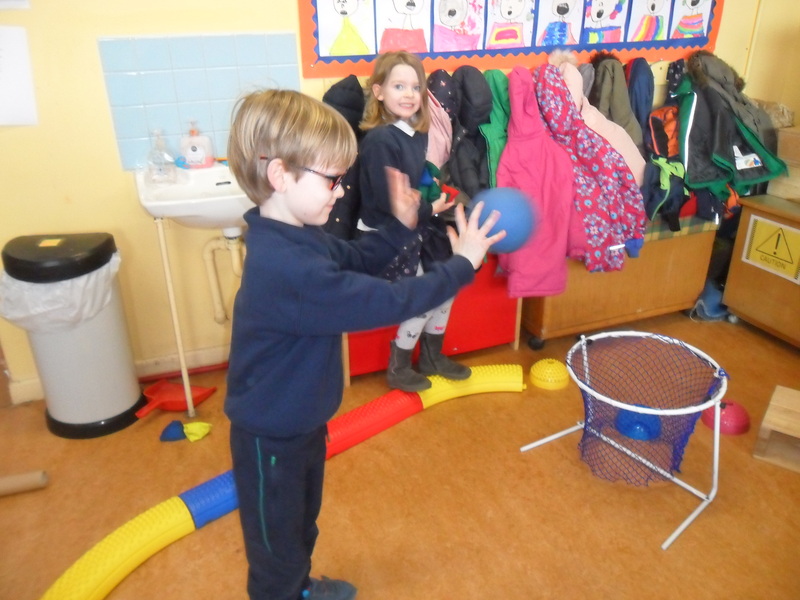 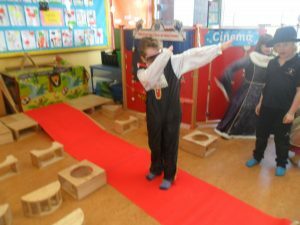 In the Home Corner the children have been in role as performers and the audience at ‘The Circus’, they were wait staff, chefs and customers in ‘The Chinese Restaurant’ and they played a variety of games at ‘The Fairground’. 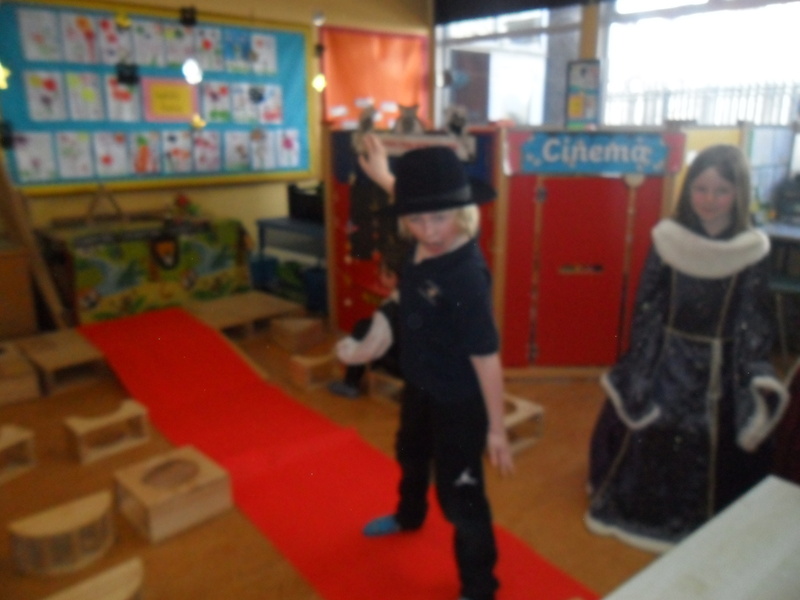 They also acted as staff and customers in ‘The Cinema’. At the Art Table the children made clown faces, Chinese fans, carnival masks and junk art awards. They told the class why their mum deserved the ‘best mum’ award! In Small World they put on puppet shows and played in the circus tent, built Lego circuses, created Chinese floats for the Chinese New Year festival and made a funfair out of Lego. 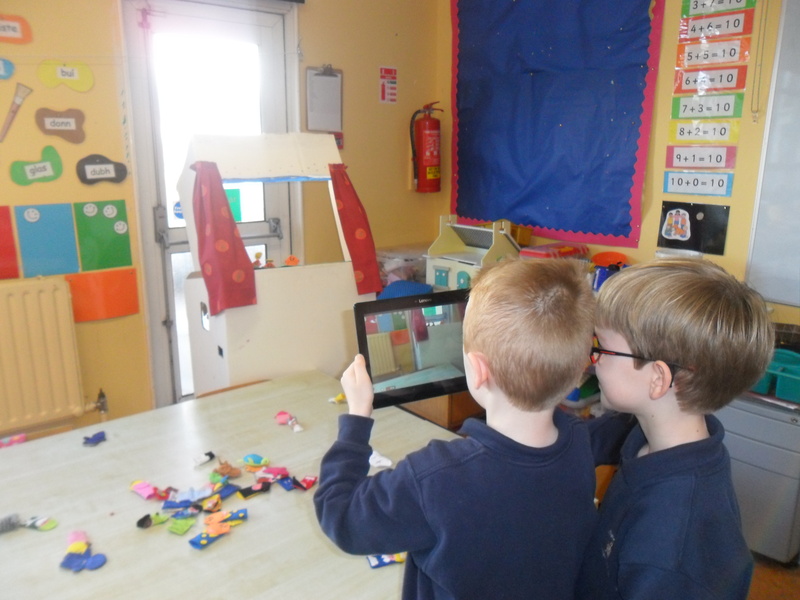 The children used the tablets to video the puppet shows. 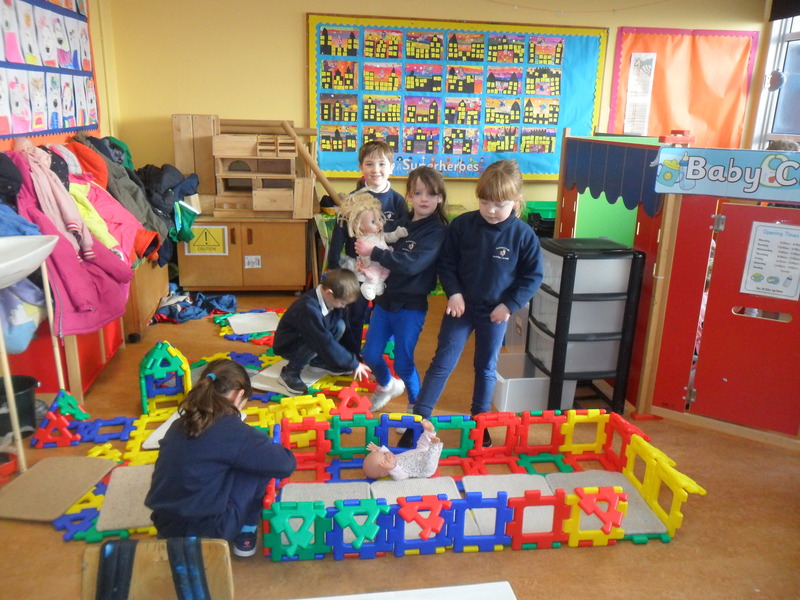 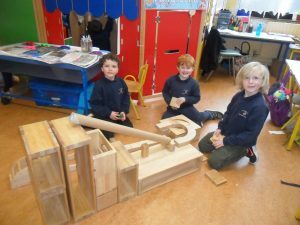 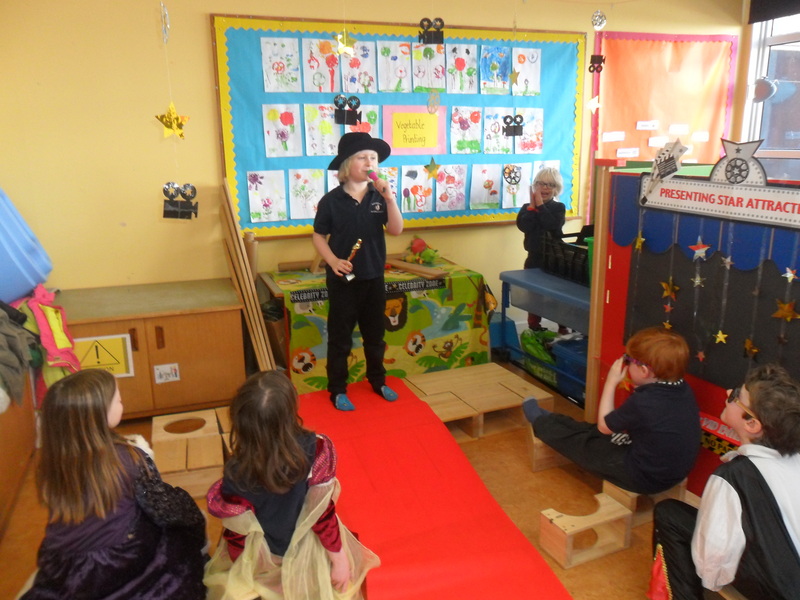 In the Construction Corner they built a Big Top, The Great Wall of China, a funfair and a stage from which they presented ‘The Oscars’! 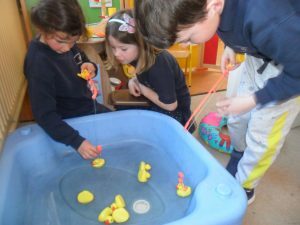 We linked these topics with the following stories in English: ‘The Singing Mermaid’, ‘The Great Race’ and ‘Dogger’. 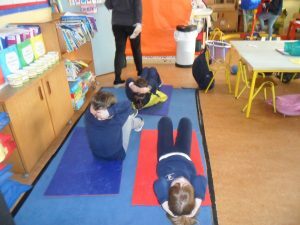 This month’s Aistear theme is ‘Our Bodies’. 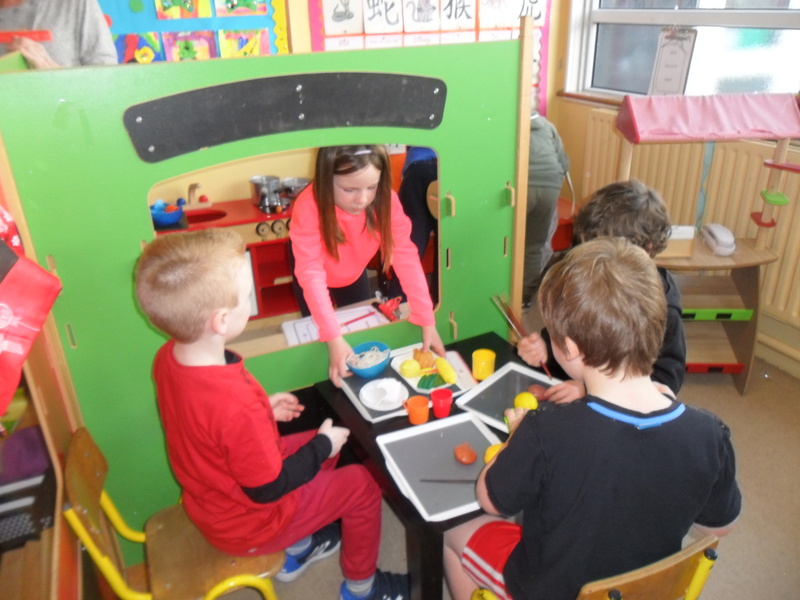 The children have been learning about healthy eating, the importance of exercise, personal hygiene and feelings. 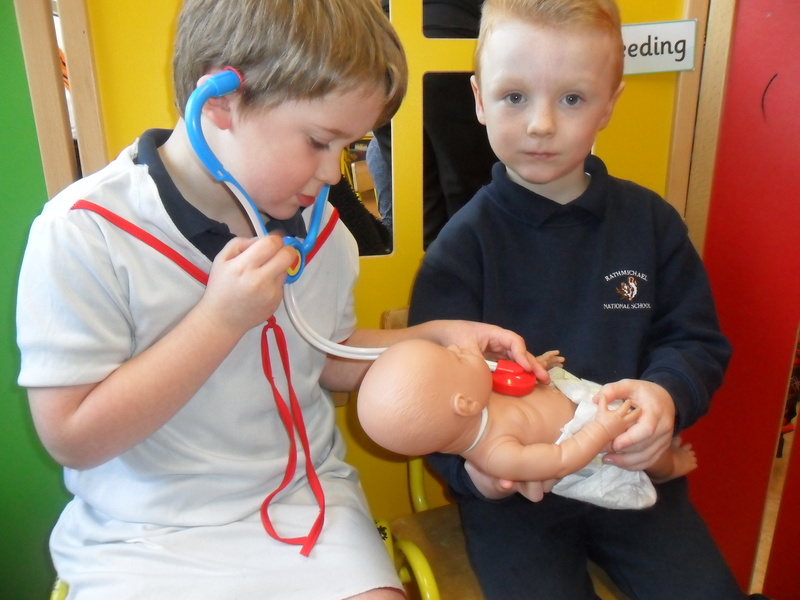 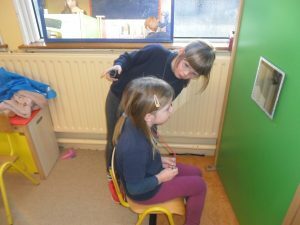 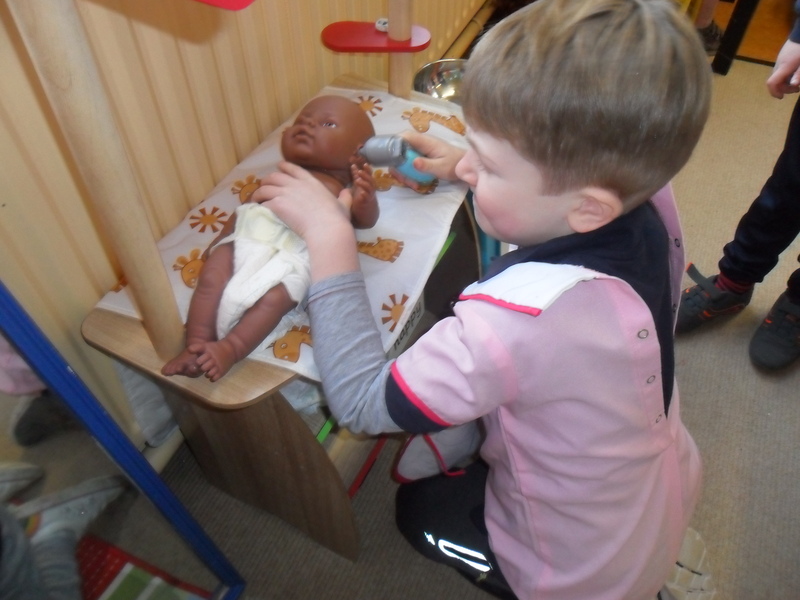 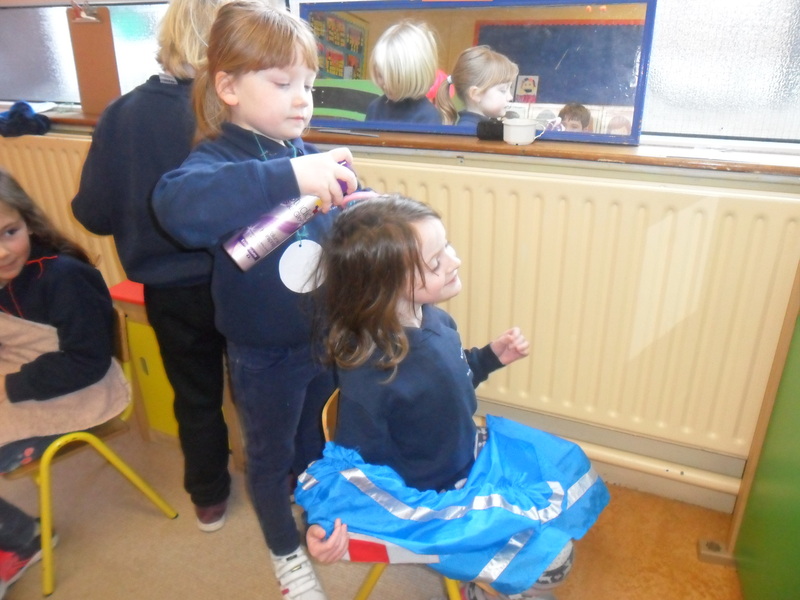 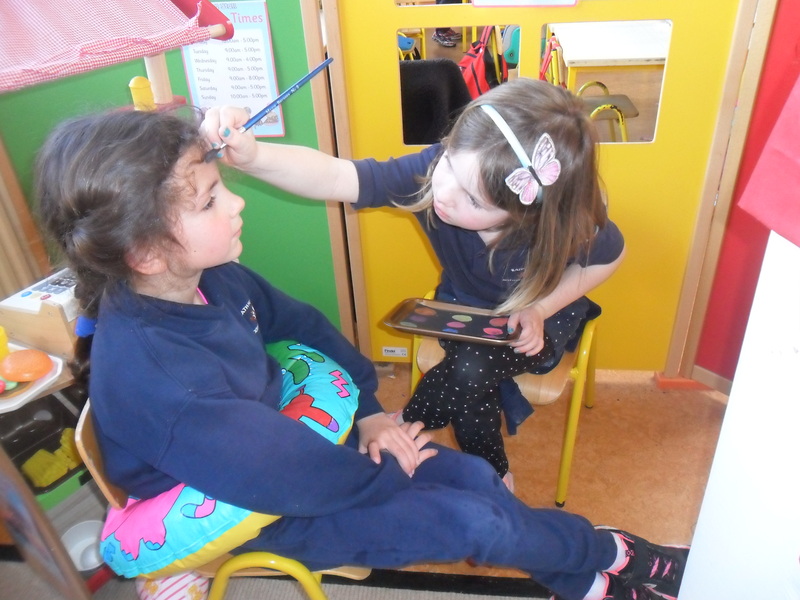 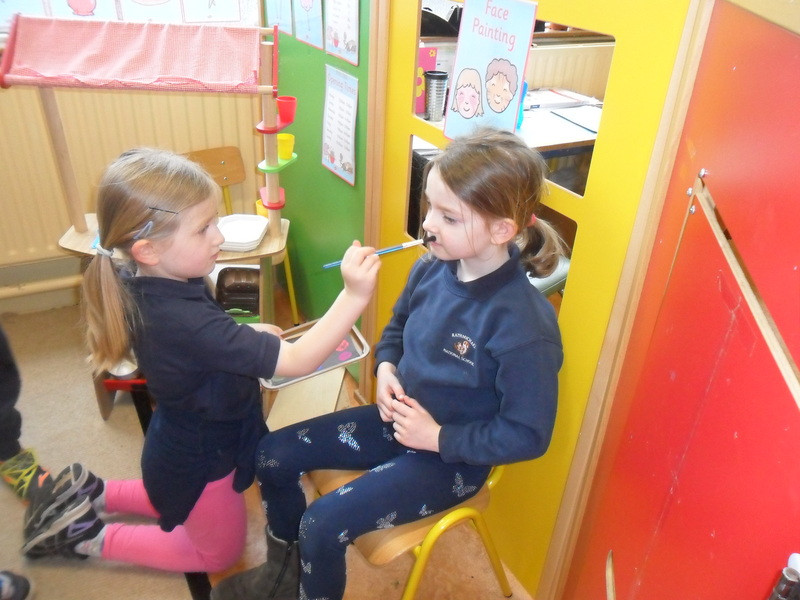 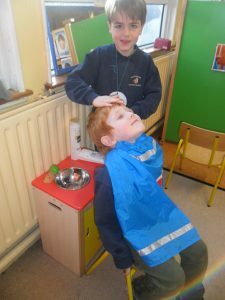 In the Home Corner they have been in role as stylists and clients in ‘The Hairdressers’, shopkeepers and customers in the ‘Fruit and Vegetable’ Shop and parents and nurses/doctors in the ‘Baby Clinic’. 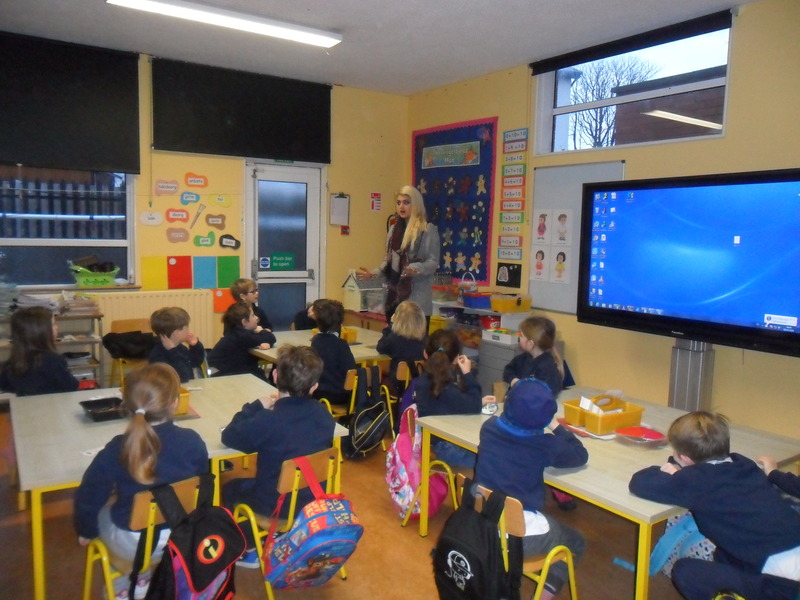 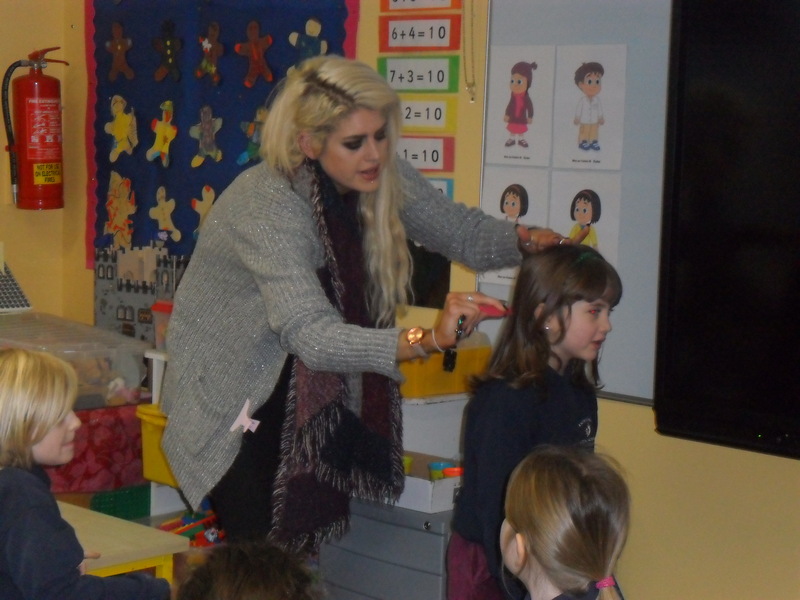 Zoe’s mum Ashling came in to talk to the class about her job as a stylist and they really enjoyed that. In the Construction Corner they built a town for the people who work and care for us in the local community. The also built a gym where they worked as trainers and clients. The also made baby equipment from polydrons. 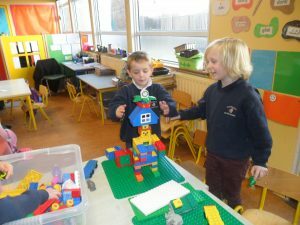 In Small World they made bodies from Mobilo and Lego. 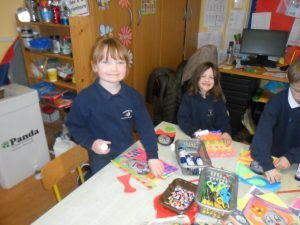 At the Art Table they made a giant food pyramid using pictures of food cut out from magazines, they painted people with ‘blow-paint’ hairstyles, they drew their favourite things in their ‘thinking’ pictures, they made themselves from junk art and they made frames for their baby photos. 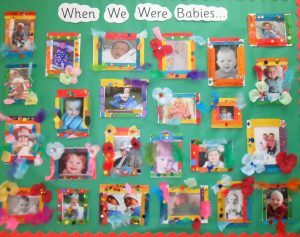 They showed each other their baby photos and talked about what had changed and what had stayed the same. We discussed what we couldn’t do as a baby that we can do now, walking, talking, reading, etc. For ‘Show and Tell’ they spoke about something they had from when they were babies and why it was special to them. This month’s Aistear theme is ‘Christmas’. The children have had a ball. 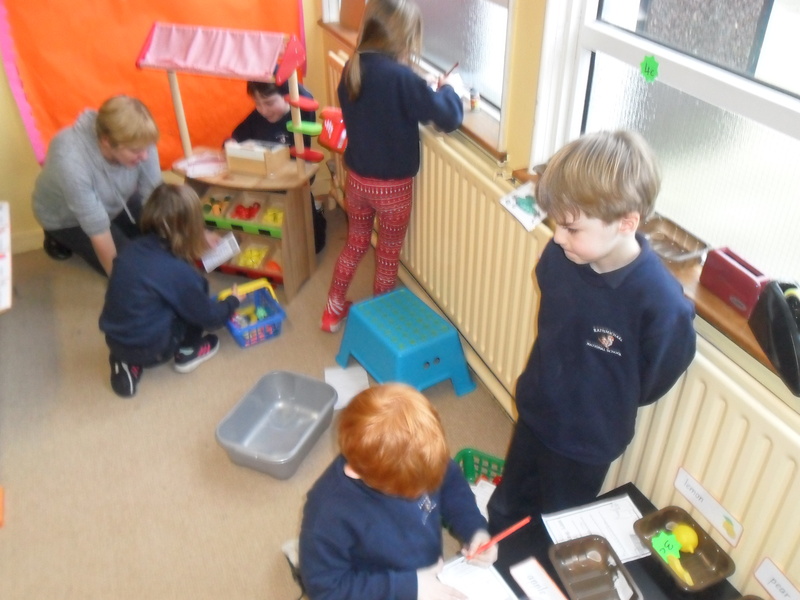 In the Home Corner they made Christmas cards and Santa lists and posted them in ‘The Christmas Post Office’. 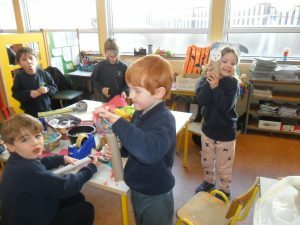 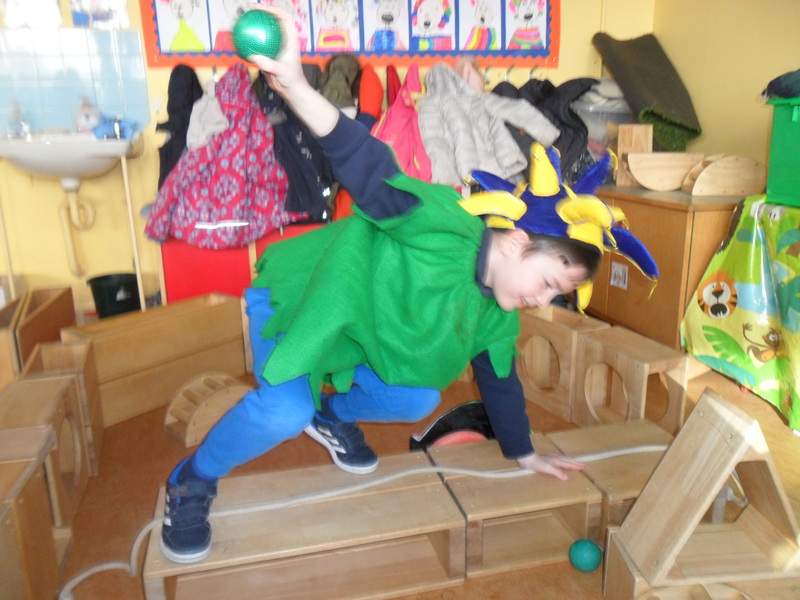 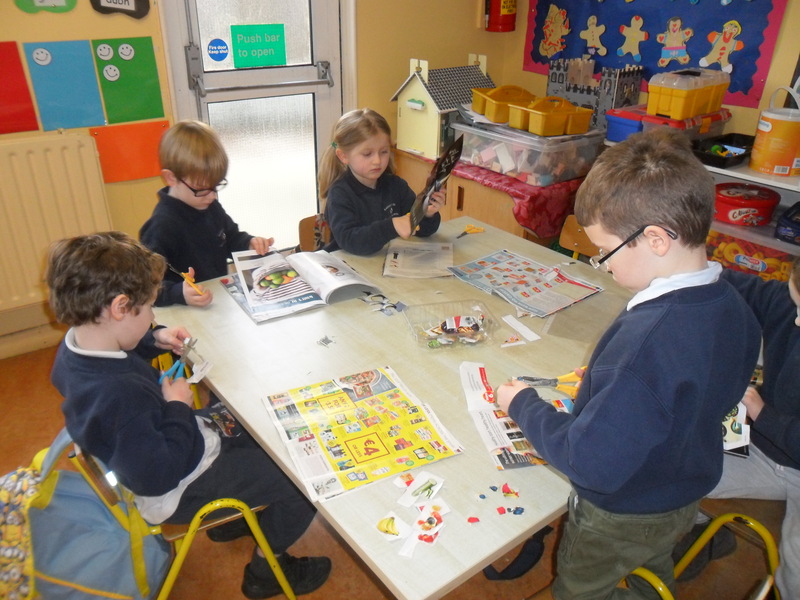 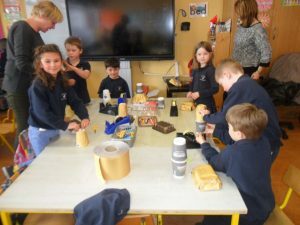 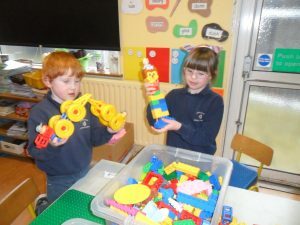 They also worked as elves in ‘The Elves’ Workshop’ designing and building toys which they then showed to the class in ‘Show and Tell’ and the children then asked them about their creations. 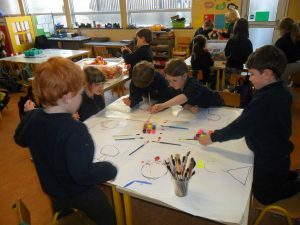 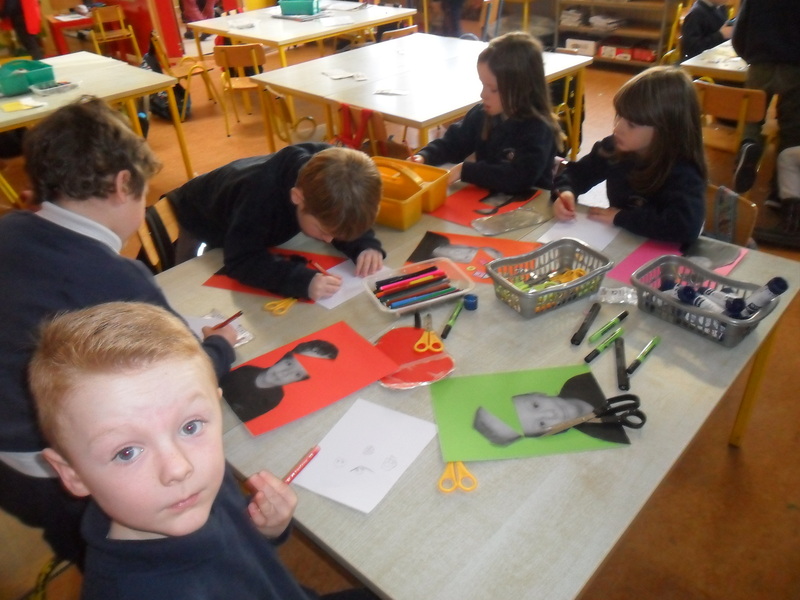 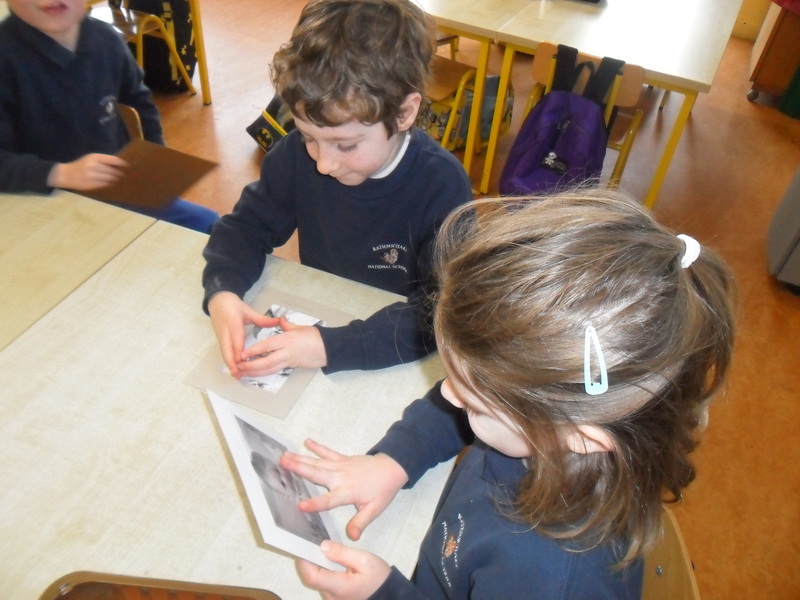 At the Art Table the children made fingerprint fairy light cards, Christmas cards for their buddies in 6th Class and snow globes. 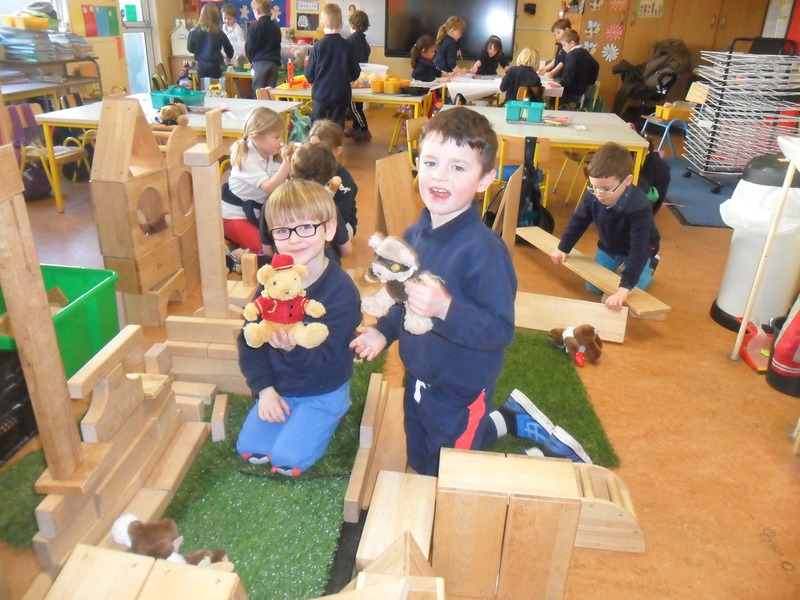 In the Construction Corner they built teddy town for Teddy Santa to deliver presents to, Santa’s sleigh and the Stable in which they acted out the story of Christmas. 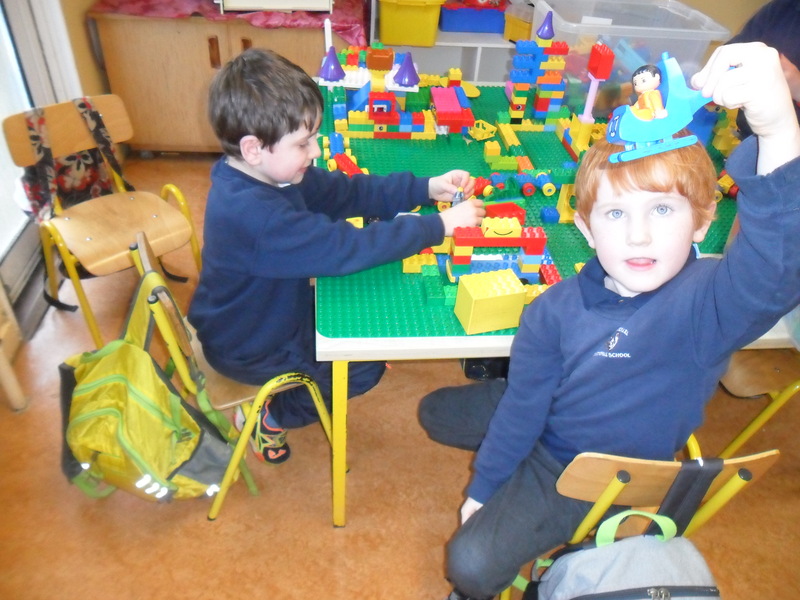 In Small World they built a town decorated for Christmas and the Nativity scene. They also made Christmas items from playdough. 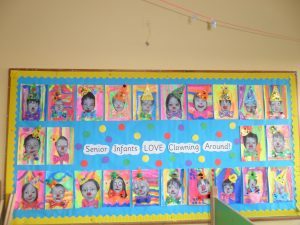 It’s been a fun month! 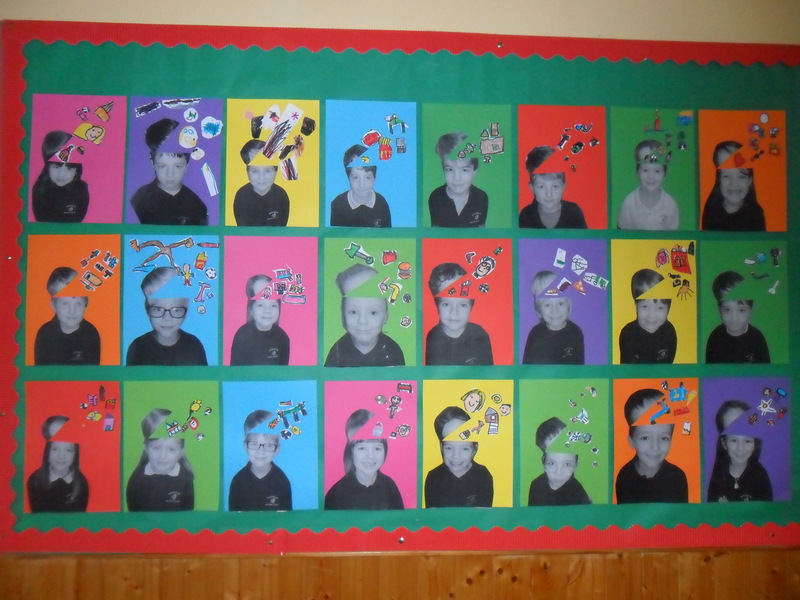 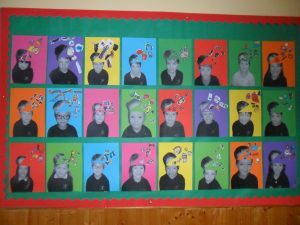 This month the children continued on with the ‘Holiday’ theme. 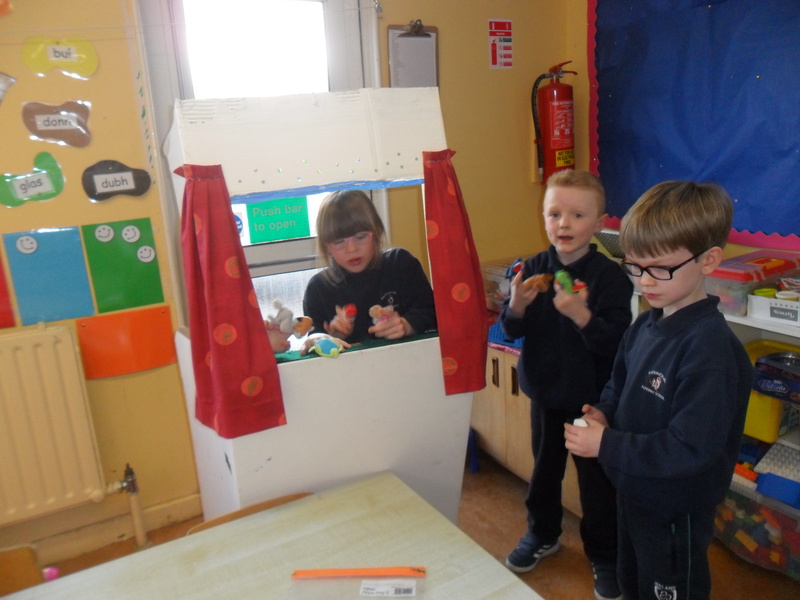 In the Home Corner they played as workers and customers in ‘The Ice-cream Parlour’ and ‘The Hotel’. 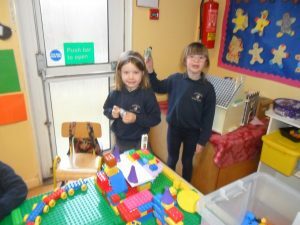 They also learned about all the different modes of transport that we travel by. They made buses, cars, trains, etc from junk art and Jaggo blocks. 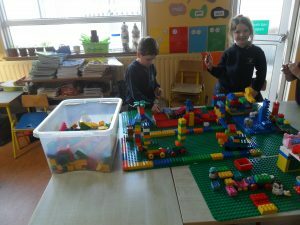 In Small World they played with the train set and built a hotel. 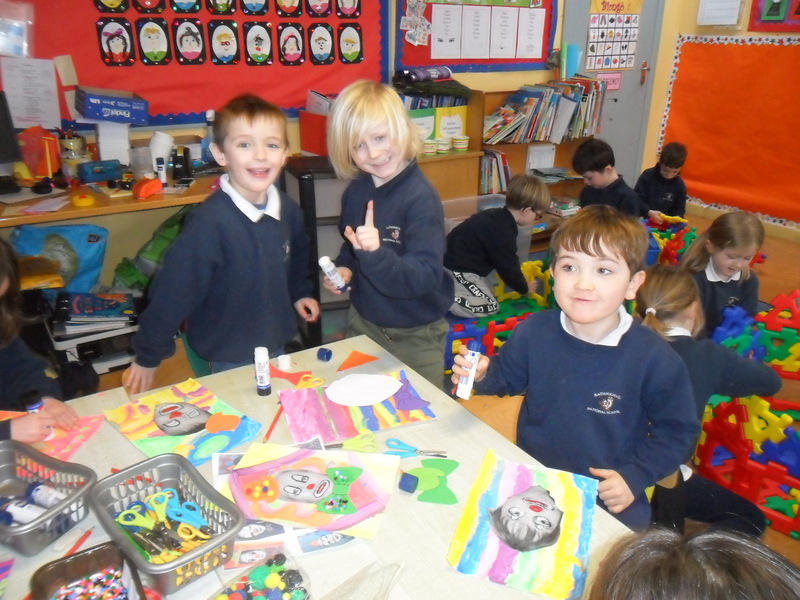 They also painted beach scenes at the Art Table. We also learned about special times of the year this month. 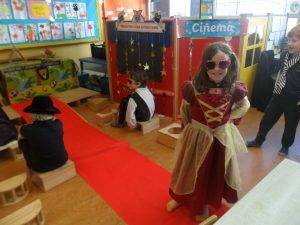 During our Hallowe’en themed week the children made ‘Shape Monsters’, they played as witches and wizards in ‘The Potion Lab’, they built a ghost train in Small World and they built the scary house from the story ‘A Dark, Dark Tale’ in the Construction Corner. 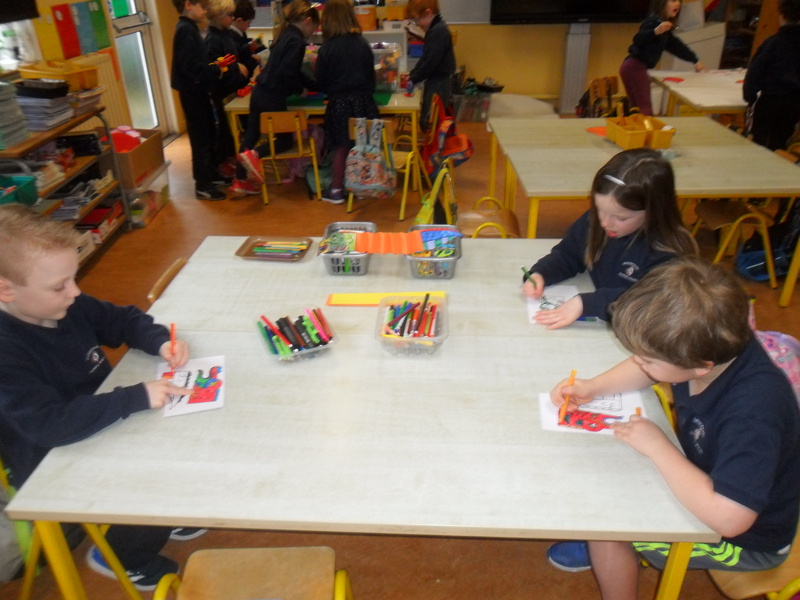 During our Autumn themed week the children went on an Autumn Hunt and collected leaves to make leaf rubbings. 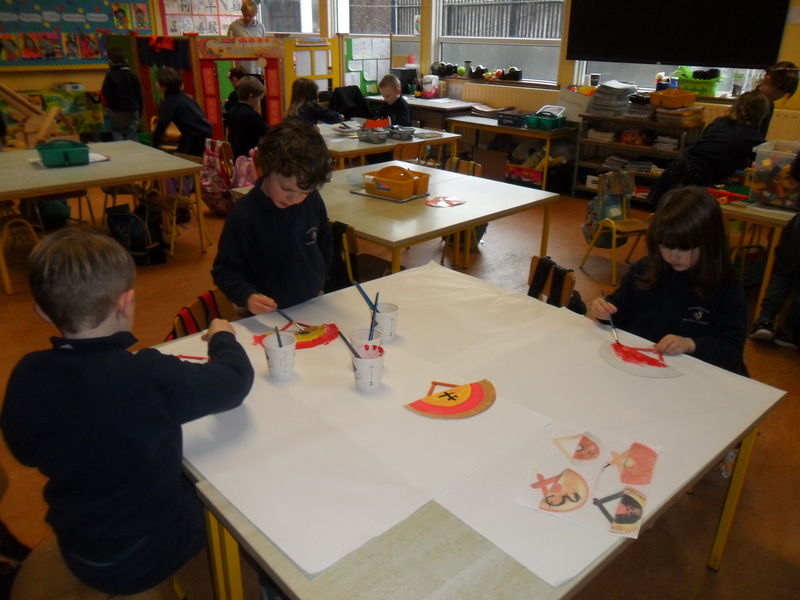 They also printed with Autumn leaves and paint. 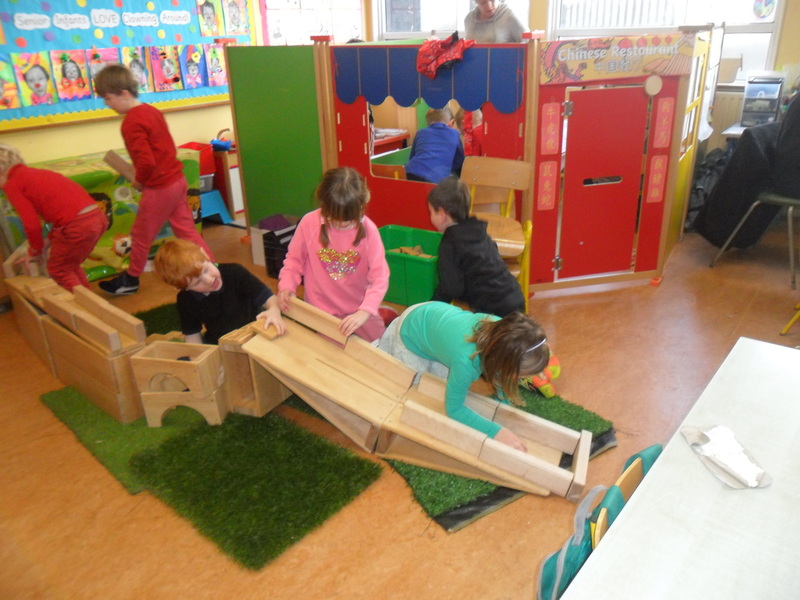 In the Construction Corner they built a woodland and played with their woodland creatures, getting them to gather food and hibernate. 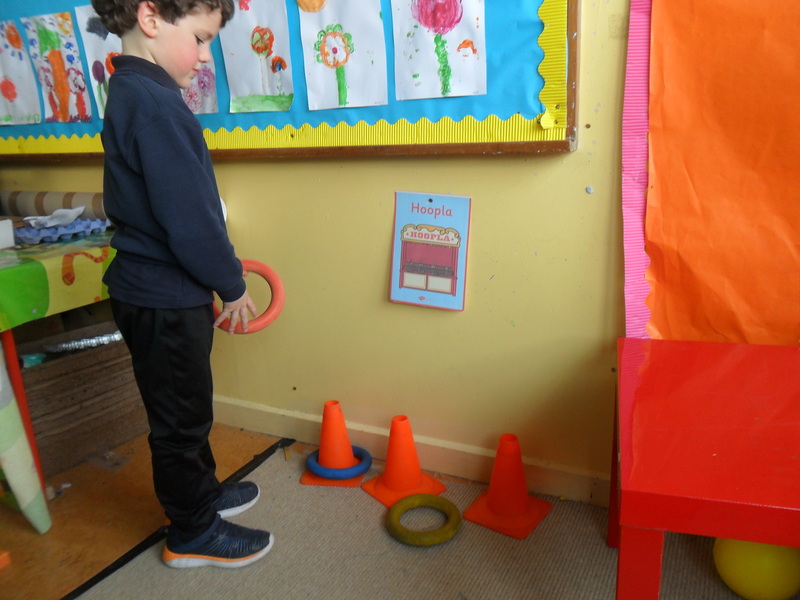 They also made signs of autumn from playdough. 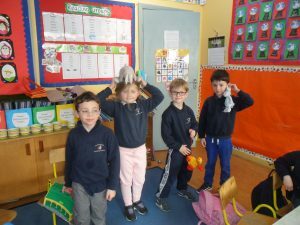 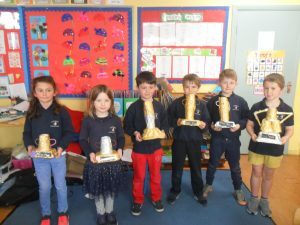 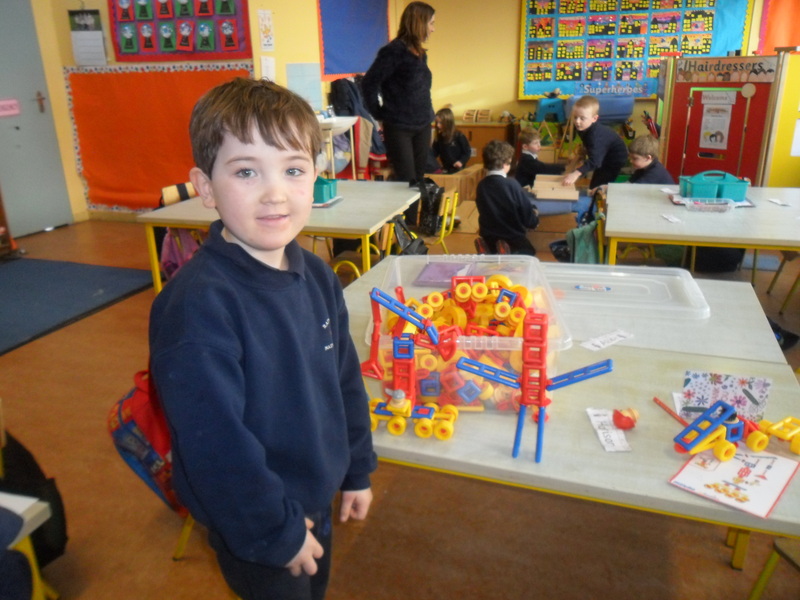 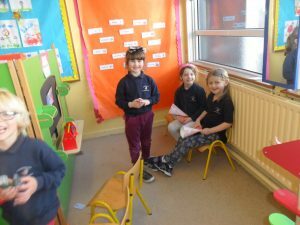 ‘Farmer Fox’ was our guest speaker this month and he came in to talk to the Junior and Senior Infants about harvest, farm machinery, the jobs a farmer does and farm safety. The children really enjoyed learning about the above topics. 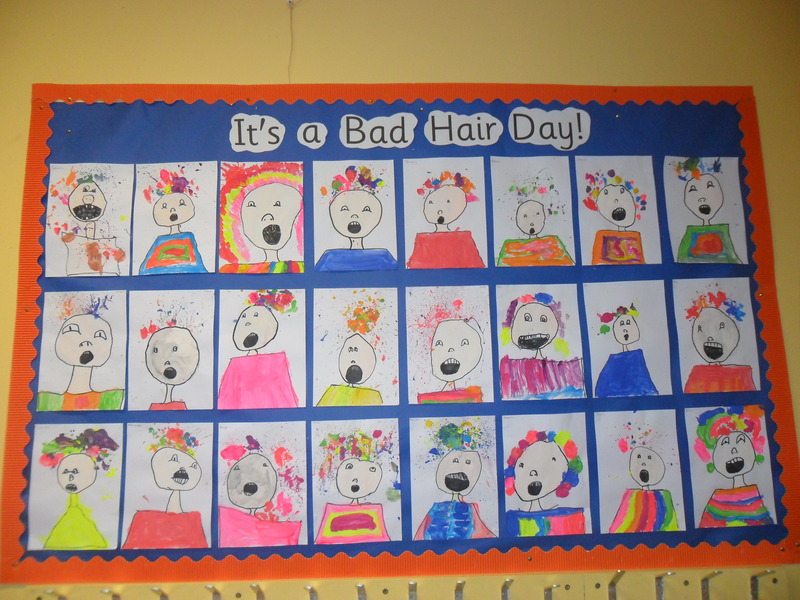 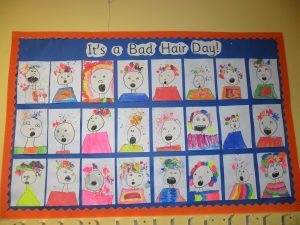 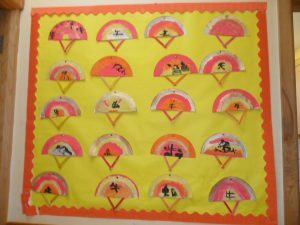 September’s Aistear theme is ‘Holidays’. We learned about preparing and packing for holidays, different types of holidays, where Ireland is on the map of the world, weather conditions and what we do on holidays. 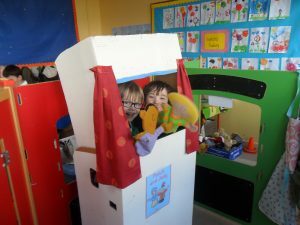 In the Home Corner the children played in role as workers and holiday makers in ‘The Travel Agency’, ‘The Airport’, and ‘The Zoo’. They also made ‘weather-testing machines’, did weather experiments and told the weather forecast in ‘The Weather Station’. 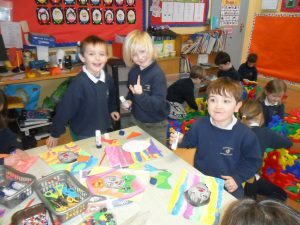 At the Art Table the children painted camper vans. They also made weather charts and clothes for teddies who were out in a variety of weather conditions. 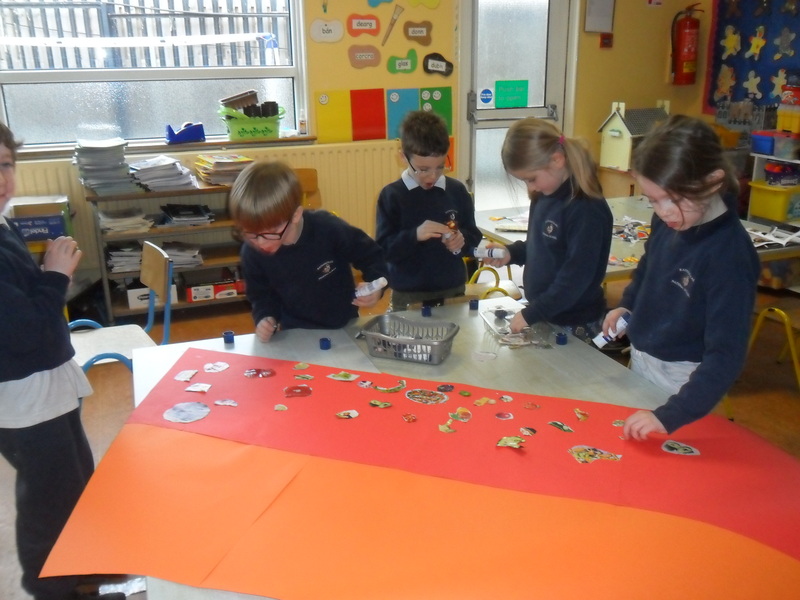 They made passports and animals from ‘Dear Zoo’ out of junk art. 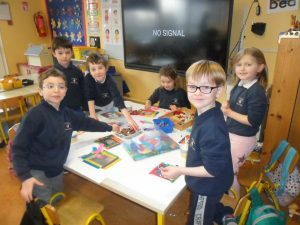 The children made items from playdough to do with the story ‘Dear Zoo’. In the Construction Corner the children built a campsite, a plane, a cruise ship and a zoo. 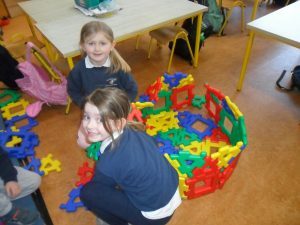 They played in these when they had finished building them. In Small World the children built a campsite, an airport, a zoo, and a fairground from Lego. The Junior and Senior Infants enjoyed their time at a teddy bears’ picnic today. They played ‘Duck, Duck, Teddy’ and ‘Teddy Tag’ when they had finished eating.